Shorty wanna be a thug! Pug Life graphic t-shirt gives this adorable pug illustration all the bling to be gangsta. A hilarious play on words and funny puppy design make this a must have graphic tee for pug lovers. Dog lovers like our Pug Life t-shirt for the undeniably cute pug puppy illustration and of course the humor. 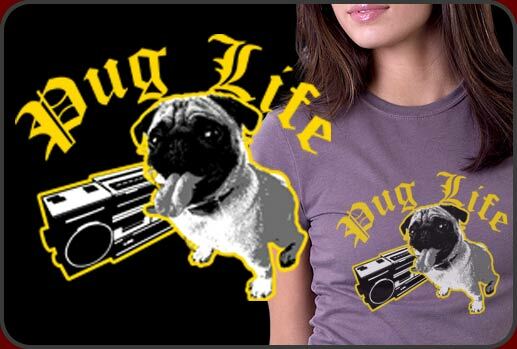 Loads of cool puppy attitude for this Pug Life t-shirt design. This is a very cool looking shirt with loads of humor and style. It's a favorite on our site since we released it and looks terrific on just about any color or style shirt you choose.